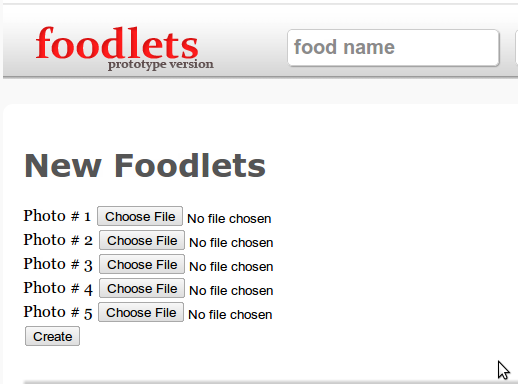 Today we have released an exciting new feature for foodlets - ‘Batch Upload for multiple foodlets creation’. Usually people take more than one picture of food dishes when they are dining out and it used to take a considerable amount of time to create foodlets for a batch of such photos - no more! Now you can upload upto 5 photos at the same time. Click on a foodlet, fill in the details and your foodlet will be published. Now the world can see what you ate. You can now create up to 5 foodlets at a time. The foodlets prototype was put online on 1st Sept. We have been working hard since then on the software development, the business development and the most vital aspect - building a community! The following is the list of some of the feature we have implemented or fixed. We created a Foodlets page on Facebook to share updates and connect with the Foodlets community on Facebook. Check it out at http://www.facebook.com/foodlets, we already have about 185 LIKEs. Rima D’costa has signed up as our PR person and she has been talking to restaurants, explaining them the concept of our ‘Visual Food Guide’ and getting feedback from them. So far the response has been impressive, restaurants are willing to work with us to get listed. Our friends have been contributing with valuable feedback and data. They are talking about foodlets and spreading the word. Da-Bangda - Create a seafood foodlet today! This is how we use foodlets!